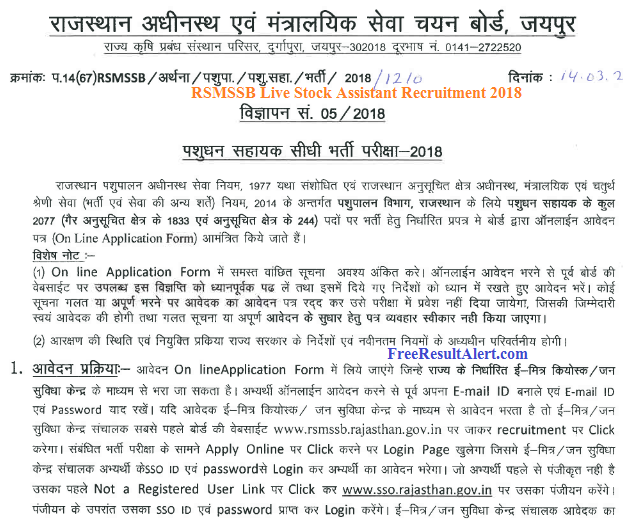 RSMSSB Live Stock Assistant Recruitment 2018:- Rajasthan Livestock Vacancy Latest News, Download RSMSSB LSA Notification as Pashudhan Sahayak Bharti 2018 Application Form Apply Online Process Starting from 12th April 2018. Rajasthan Subordinate & Ministerial Services Selection Board (RSMSSB) is back to back giving surprises by releasing Rajasthan Live Stock Recruitment 2018 Notification in for various post. This time RSMSSB has released RSMSSB 2018 LSA Vacancy Latest News. Board has released 2077 Vacancies according to RSMSSB Live Stock Vacancies for Tribal and Non-Tribal Candidates. Now You can Check Here Livestock Assistant Livestock recruitment notification and vacancy details according to each category. Rajasthan Live Stock Assistant is also known as Rajasthan Pashudhan Sahayak Bharti. Its application process is going to start from April 12, 2018. According to RSMSSB LSA Notification many important details have been disclosed. Candidates can fill the Rajasthan Live Stock Assistant Application Form Start Date is the found below. from the Direct Official Link. Check the RSMSSB Live Stock Assistant Recruitment 2018 Vacancies notificaiton and Eligibility below. Pay Scale 26300/- to 85500/- Rs. If candidates wants to apply directly then they are suggested to collect all necessary documents. The documents details are given in RSMSSB Rajasthan Sahayak Notification 2018 Download. Also candidates know one thing that the application fee will be accepted in online mode only as mentioned in the Rajasthan RSMSSB Official Livestock Assistant LSA Recruitment Notification at Official Portal. so make sure you deposit it carefully. Candidate must be minimum 12th passed in the subjects Physics, Chemistry and Biology or Horticulture (Agriculture) from RBSE or equivalent recognized board. Candidate have done 1 or 2 year training in live stock assistant from a recognized institution. OBC (Non-Creamy Layer) 350/- Rs. RSMSSB has released the last date and start date of applying online for RSMSSB Recruitment 2018 for the Livestock Assistant (LSA) or pashudhan sahayak vacancy latest news. Candidate should know that this is a great chance for all 12th passed students. For any requirement and information students can download Rajasthan LSA Notification from the direct links below. Note – If you have any query regarding the Rajasthan Live Stock Recruitment Vacancies Notification. Then, Just Comment Down Below. Our Support Team will Help You. Open, Official Portal i.e. www.rsmssb.rajasthan.gov.in. There, Scroll Down Below & Click on the Advertisement Recruitment. Find & Click on the RSMSSB Live Stock Assistant Recruitment 2018 option. A PDF File will be starts downloading to your storage location. Finally !! Open & Read the Complete Recruitment for the LSA Recruitment Rajasthan RSMSSB.